All eyes are on Austin where election 2008 has become the center of this presidential campaign. On March 4th, voters will decide who they want to represent them as President of the United States; the Democrats or the Republicans. Never, in the history of the electoral process, have we witnessed a surge in support, volunteerism, and a general enthusiasm that has been exhibited by individuals across our great nation. This is Election 2008: History in the Making. While Senator John McCain is the presumptive winner of the Republican Party, the citizens of Austin in particular and Texas in general, may have the opportunity to cast a deciding vote which can launch Senator Barack Obama to victory, or give Senator Hillary Clinton the momentum she needs to continue this campaign. Since Texas has a “prima-caucus,” that is, a primary followed by a caucus, Barack Obama may be able to declare more delegates. At the very least, while Senator Clinton may receive more popular votes, it seems that a caucus win is in the cards for Senator Obama. Election 2008 has become history in the making. For the first time, a woman and an African-American are running for the top prize. What will happen? No one knows for sure. The one thing we do know, however, is that more and more young people are voting for the first time; getting involved in the process; and coming together to support their candidate of choice. As the Denver Convention draws closer and closer, things will inevitably change day by day. The one component that will not change is Election 2008 has brought a nation together in a common purpose – electing a candidate worthy to become the next President of the United States. National Democratic Convention was concluded August 28. in Denver, Colorado; Barack Obama accepted the Democratic presidential nomination. For the first time, a major US party has nominated a black American for President. This is a milestone whose significance cannot be overestimated, regardless of the result on 4 November. Today, November 04, 2008 America votes! Across the country voters are turning out in what could be historic numbers, in some cases spending hours in serpentine lines waiting for a chance to vote. Obama elected November 04, 2008 Barack Obama spoke at a rally in Grant Park in Chicago, Illinois, after winning the race for the White House Tuesday night. 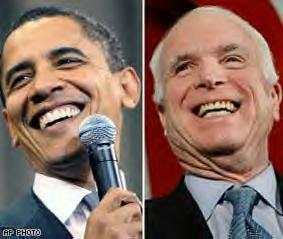 Republican John McCain concedes the presidential race to Barack Obama. Flanked by wife Cindy and running-mate Sarah Palin, McCain spoke to supporters shortly after 9 p.m. Tuesday. Obama Brings Changes November 05, 2008 the official presidential website "Change.Org" is launched; it is an example of Obama's approach to technology. January 17, 2009, 44th President elect, Barack Obama boards a train to Washington where he will be inaugurated on Tuesday. Vice-President elect Joe Biden and family join him.